Named after the Reverend James Reid, MSU's second president, this four story building houses the College of Education, Health and Human Development, as well as TRIO (3rd floor), the Masters of Science in Science Education (4th floor), and some College of Nursing offices (4th floor). The Department of Education is on the first, second and fourth floors. The dean's office for the College of Education, Health and Human Development is located on the second floor, as well as the Field Placement and Teacher Licensure office. The technology education classroom and the instructional computer lab for education are located on the fourth floor, along with the Center for Bilingual and Multicultural Education, the Science and Math Resource Center, McNair Scholars program, and the Indian Leadership Education and Development (I LEAD) program. Student computer labs are located on the third and fourth floors. 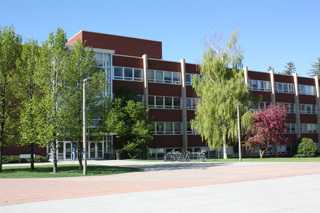 The education advising center is located on the first floor. The third floor houses some programs from the Department of Health and Human Development-nutrition and sustainable food faculty offices, the Montana Dietetic Internship, Montana Team Nutrition, and Montana University System (MUS) Wellness.